As reputations go, The Twilight Sad's is as loud as they come. Since the release of their debut LP 14 Autumns & 15 Winters, the Scottish ensemble have earned a reputation for their ear-canal-crushing compositions. Yet beneath this deafening veneer lies the sentimental songwriting of James Graham, whose introspective paeans cement-—yet contradict—the band's thunderstorm of instrument. In recent time, this softer touch has started to work its way through, with the band often stripping down to their acoustic bare bones. 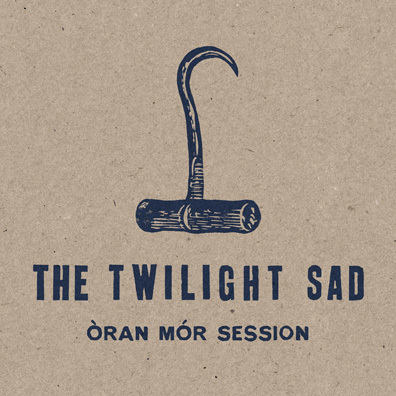 Oran Mor Session is a welcome testament to their knack for shifting to a lower key. Recorded in the hollows of Glasgow's Oran Mor venue, this is a nine track acoustic rendition of output from their most recent full-length, Nobody Wants to Be Here and Nobody Wants to Leave. A sullen, beautiful bleakness seems to entomb the entire recording. "Last January" is a morbid, crystal clear weep; "Pills I Swallow" dissolves into the downward spiral of Graham's blunt Kilsyth drawl; and "The Airport" is a ghostly echo of piano and brittle strum that's buried in the moribund closing line of "you won't get too low, no, no..."